Pharmakeyboard_arrow_rightDevelopment of mini-tablets containing 10% Vitamin B2 and C: characterization and tableting performance. Development of mini-tablets containing 10% Vitamin B2 and C: characterization and tableting performance. Mini-tablet use continues to grow as an accepted option for small volume, high-value products, especially for specific patient populations. Mini-tablet applications, whether as single or multi-unit, allow fixed combinations and dose titrations. The typical diameter below 3.0 mm offers an approach for elusive populations like pediatric and geriatric patients or patients suffering from dysphagia. The aim of this study was to demonstrate experimental design, equipment feasibility, lactose-based material performance, and critical material attributes within a typical mini-tablet manufacture unit operation. Example formulations comprising two different APIs and three functional excipients were chosen to investigate compaction and release performances, as well as the impact of particle size. Powder blends comprising 10% active pharmaceutical ingredient (API), 89% excipient, and 1% lubricant were used in all cases. As APIs vitamin B2 (riboflavin) and vitamin C (ascorbic acid) were chosen for handling and functionality reasons. Laser diffraction particle size analysis data showed d10, d50, and d90 values to be 0.8 μm, 3.7 μm, and 10.7 μm for vitamin B2, and 43 μm, 282 μm, 557 μm for vitamin C, respectively. Excipients examined included spray-dried lactose, FlowLac®100, and lactose-based, co-processed excipients (CPE) CombiLac® and RetaLac®. d50 values for the three excipients were comparable and found in the range between 120 and 160 μm. Magnesium stearate, at 1.0%, was used as a lubricant. Material source and type used is summarized (Table 1). Table 1: material source and type used. Blends were prepared using an IMA CyLab® bin blender, and mixing quality was monitored by a VIAVI MicroNIR® PAT-W probe. In all cases 90 revolutions were used to incorporate the API and 30 for final lubrication, which were believed sufficient as supported by moving block standard deviation. Compaction was performed using an 8-station rotary tablet press, Prexima® 80 (IMA, Italy). Punch diameter was 2.5 mm with round, flat-faced shape. XIMA® software was used for data acquisition. Forces between 5 and 20 kN and a constant rotational speed of 20 rpm were applied. Powder blend angle of repose was determined according to compendial methods (Ph.Eur. 2.9.16), and average tablet breaking force was evaluated using a Erweka® TBH 425TD hardness tester with ten compacts. Mini-tablet manufacturing process followed a typical direct compression (DC) scheme: excipient and API blending followed by lubrication and compaction. Vitamin B2 mini-tablet dissolution testing was performed according to Ph.Eur. 2.9.3 using an Agilent® 1260 Infinity Quaternary LC spectrophotometer at 445 nm. Tests were performed in triplicate. Vitamin B2 and C blend compression-breaking force profiles were assessed. Results showed that the finer, more plastically deforming vitamin B2 exhibited approximately twice the absolute breaking force compared to the coarser, more brittle vitamin C (Figure 1). 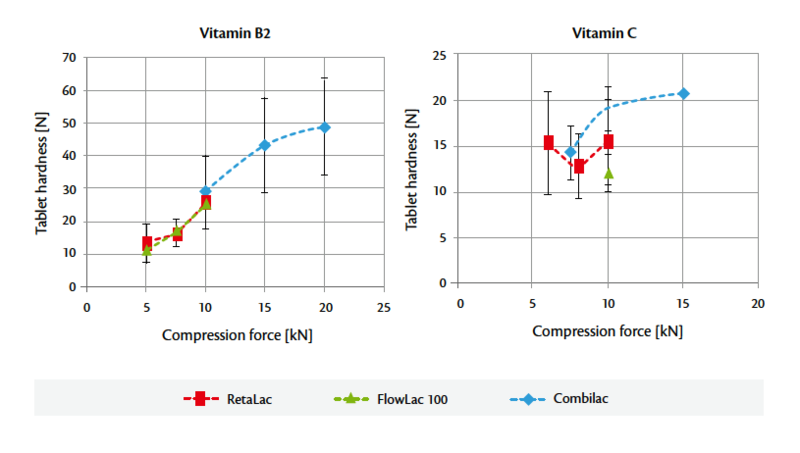 At 10 kN compaction force, CombiLac®, FlowLac®100, and RetaLac® performance was compensated by vitamin B2. However, the coarser, more brittle vitamin C demonstrated greater differences in binder compaction behavior. A ranking in breaking force was possible: RetaLac® performed better than spraydried FlowLac® 100 and CombiLac®. This might be attributed to RetaLac®’s composition having the highest level of plastically deforming materials, dominated by hypromellose. Additionally, load-time profiles showed a shift to greater plasticity by maintaining an increased curve symmetry, especially, when RetaLac® was used. Figure 1: compression-hardness profiles of 10% vitamin B2 and C lubricated blends. When flowability impact on tablet weight variation was monitored, particle size and size distribution, as well as other material characteristics such as API morphology, were considered critical. Powder blends demonstrating best flowability resulted in lowest tablet mass relative standard deviation (RSD). A similar trend was found for α-lactose monohydrate-based mixtures by Rumondor et al. Nevertheless, ratio and absolute values in angle of repose vs. tablet mass RSD were found to be material specific too. At a 39° angle of repose, vitamin C blends showed higher tablet mass RSD values (3-4%) in comparison to vitamin B2 (1-2%). The flowability change “sensitivity” also was found to be different for the two example formulations as indicated by the overall regression line inclinations (Figure 2). Tablet mass RSD increased over 4 times faster, when vitamin B2 blend was compacted. Vitamin B2 sustained drug release, using RetaLac® as an excipient, was shown to be independent from mini-tablet breaking force between 28 and 48 N, which is in full agreement with typical tablets with 80% release between 4 and 5 hours. In comparison, FlowLac® 100 showed immediate release performance with 80% release after 15 min. Subsequently, a limited stability study has been conducted for RetaLac® – and FlowLac® 100-based formulations, monitoring tablet dimensions and breaking forces. The goal was to evaluate possible elastic recovery impact on final tablet dimensions and/or storage-induced changes in tablet breaking force pertaining to API release. For that reason, tablet diameter, thickness, and breaking force changes were investigated 7 and 28 days after compaction at 25°C and 60% RH evaluating mini-tablets compacted at 10 kN force. Overall dimensional changes were little and did not exceed 7% for RetaLac® and 1% for FlowLac® 100 when tablet diameter was measured after one month. At 4 weeks, tablet thickness increased by 2% for both formulations. Breaking force differed by approximately 28% for the FlowLac® – and 18% for RetaLac® – based formulations. Figure 2: tablet weight variation – powder flow expressed by tablet mass RSD and angle of repose for 10% vitamin B2 and C formulations at 6 (Δ), 8 (◊), and 10 kN (α) compaction force and 20 rpm rotational speed. 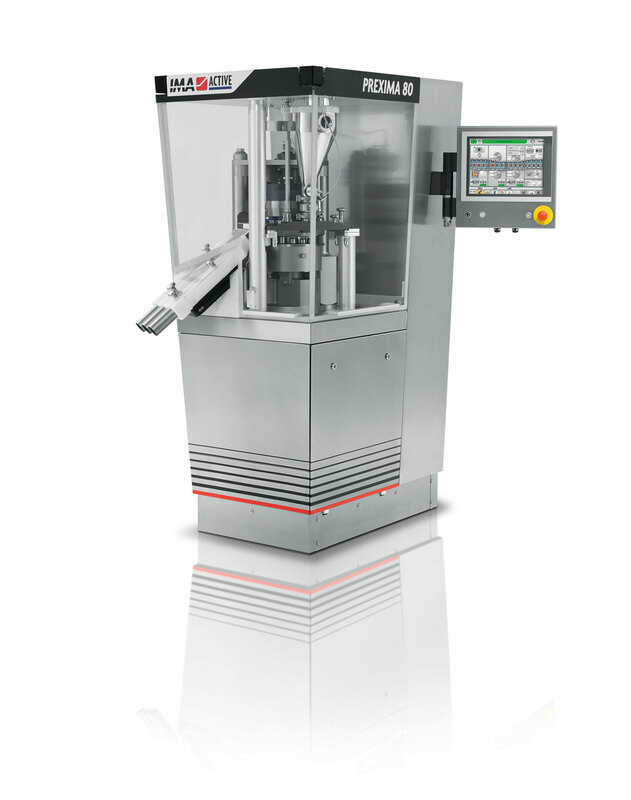 Co-processed, lactose-based excipients, CombiLac® and RetaLac®, were compared to spray-dried lactose, FlowLac® 100, in mini-tablet manufacture unit operations using 8-station Prexima® 80 rotary press. All materials showed performance within expected ranges when compactibility, tablet mass uniformity, and vitamin B2 API release were investigated. Amongst other material specific properties, blend flowability was confirmed to be critical for tablet weight uniformity. An indirect correlation to API particle size was given for the investigated vitamin B2 and C systems. Retesting mini-tablets after 1 month at 25°C, and 60% RH showed no significant changes in tablet diameter or thickness. Breaking force variations were slightly larger. Results clearly demonstrated design, equipment feasibility, and material performance.